"This is basically sweet, caramelized milk. It's so easy and so delicious. I like it better than caramel sauce on anything you'd use caramel sauce, such as on ice cream, toast, cookies, cakes, brownies, or to pour on people." Wash the nail and pound it into the top of can of sweetened condensed milk to make 2 small holes on opposite sides of the top. Remove nail. Place the can of condensed milk into a small saucepan and pour in water to reach high up the side of the can. Bring water to a boil; reduce heat to low. Simmer milk in the can for 3 to 4 hours. Milk will slowly turn light to medium brown and become thicker as it cooks. Add more water as it boils down. 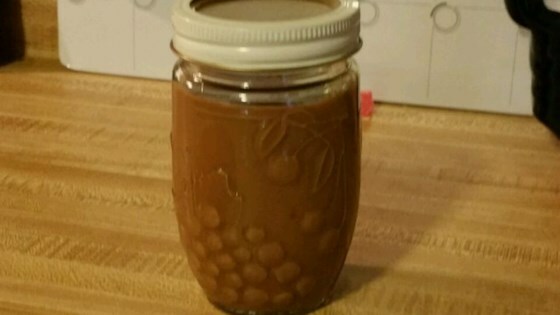 Remove lid from can and pour dulce de leche into a bowl. Whisk to break up any lumps and mix thicker caramel from the bottom into the rest of the syrup. Make sure your can is magnetic with a common fridge magnet to assure its safe to boil! Otherwise this recipe works great!!!!! I made it to put in my dulce de leche apple empanadas ?? Excellent, easy and delicious. You can cook it to a thicker or even soft solid consistency also. Be very careful to keep a close watch that the water does all evaporate!